Among Apple's many announcements on Thursday, some of the more intriguing aspects were the things Apple execs didn’t really talk about. CEO Tim Cook briefly teased the launch of Apple’s WatchKit, which will let third-party app developers create compatible apps for the Apple Watch. 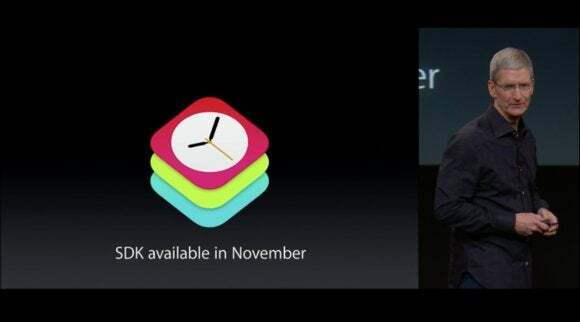 The Apple Watch is slated to launch sometime in early 2015, and the WatchKit SDK will be available in November. 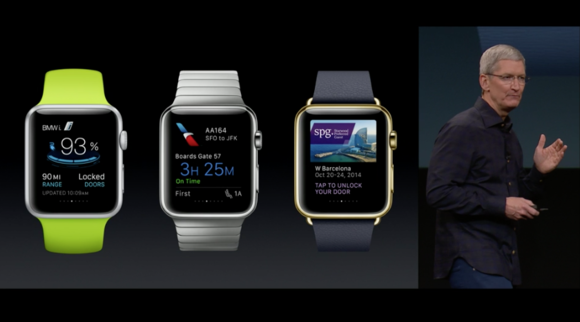 WatchKit was first announced during September’s event, when Apple unveiled the Apple Watch. But today’s event made the SDK more concrete, with its own prospective launch date. Apple has already been working on apps for the Apple watch with selected third-party companies—Cook name-checked BMW, American Airlines, and Starwood—but come November, even more developers can join the Watch party. “We can’t wait to see what amazing experiences they’ll come up with,” said Cook during Thursday's event. Some Apple Watch apps are already in the works, but WatchKit will let any app developer work on it. Why this matters: Apple has welcomed third-party developers with open arms in 2014. The company has long allowed standalone apps for iOS, but it's opened up the platform even more this year by releasing dev kits that introduce significantly more connectivity. We’ve seen HealthKit take off, which allows health and fitness apps to talk to one another and share information within Apple’s dedicated Health app. We learned about HomeKit, which will let developers create apps that will be integrated with connected-home products controlled via iOS. And now with the Apple Watch, we have WatchKit.